Obituary – Bocox, Don Russell « Perry High School Alumni Association, Inc.
﻿﻿- son of Mr. and Mrs. 0. E. Bocox of Perry, was born in Orlando on Nov. 27, 1916. Bocox attended the elementary grades in the rural schools of Blackwell, Rose Hill and Sunny Slope and attended high school in Perry. During his high school career he was captain of the wrestling team and an F. F. A. member. Following graduation he expects to attend a junior college. 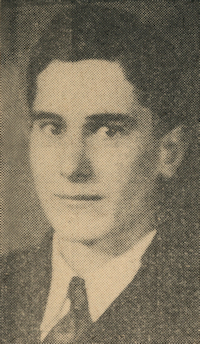 Don Russell Bocox, 86, formerly of Perry, Oklahoma was the son of Orie and Evelyn (Huffer) Bocox. He was born November 27, 1920 at Orlando, Oklahoma and died Tuesday, July 24, 2007 at Claremore Veterans Center in Claremore, Oklahoma. Don graduated from Perry High School where he enjoyed sports. He was the captain of his wrestling team, coached by John Divine. He later attended Ponca City Business College and was employed by Auto Electric Company and Continental Oil Company. Don served his country proudly in the United States Army during World War II. He was stationed in the South Pacific. He was with the army’s 44th tank battalion and also served one year in Japan. He returned home to Noble County after the war and purchased a farm and began farming. He was a former member of the First Baptist Church in Ponca City and also Zion Lutheran Church in Perry, Oklahoma. After retiring from farming Don went to the Claremore Veterans Center where they cared and loved him until his death. Don was loved by his family and friends and always carried psalms 91 next to his heart all during the war. Graveside services will be at 2:00 p.m. Friday, July 27, 2007 at Grace Hill Memorial Pavilion in Grace Hill Cemetery in Perry. Rev. Roger Dunn will officiate. Services are under the direction of Brown-Dugger Funeral Home of Perry. Memorials may be made to the charity of the donor’s choice in care of Brown-Dugger Funeral Home, 1010 N. 7th Street, Perry, Oklahoma 73077. He is survived by his daughter, Loretta Wherry of Oklahoma City, Oklahoma, one granddaughter, Angela Curtis of Oklahoma City, Oklahoma, two great-granddaughters, Cali and Katherine Curtis of Oklahoma City, Oklahoma, and one sister, Fran Palm, of Tulsa, Oklahoma. He was preceded in death by his parents, two brothers Jack and George, and two sisters Cherrie and Ruth.